Free Delivery on Orders Over £10 at Book People Find your next favourite book and pay nothing extra thanks to this cost-free delivery discount from Book People! 5% Off Orders Over £30 at Book People Treat yo shelf! Get 5% off your next order over £30 with our discount code. Discover Up to 88% Savings in the Easter Sale at Book People Get your reading hat on this Easter whilst you can save yourself a ridiculous amount in Book People's Easter sale! Up to £20 Off Historical Fiction Books at Book People Combine a bit of fact and fiction into your reading whilst paying far less for the privilege thanks to Book People! Up to 50% Off Fantasy Books and Novels at Book People Find some fiction fit for your budget by searching Book People's discount range of fantasy novels. Up to £10 Off Education Books at Book People From literature to language, be sure to save on some essential education texts from Book People! Up to £16 Off Selected Nature Books at Book People Do some research into the nature of the earth at a great price by picking some nature-related literature at Book People! Free Delivery on Orders Over £25 at Book People Don't sweat over extra delivery costs, bag your books and rest assured of free delivery on orders over £25. Free UK Delivery on First Orders at Book People Enjoy free UK delivery with your first order at Book People. For the bookworm, academic and anyone who likes to pick up a good read - immerse yourself in all types of literature with Book People. This is where you will find an array of fiction and nonfiction titles to suit every read need - and whether you want the latest gardening guide, a classic Harry Potter book or contemporary best seller - with Book People you will always be armed with inspiring words and stories. Perhaps you’re going on holiday and need a light hearted read to pass the time on the beach, maybe you want a new collection of bedtime stories for your child or perhaps you want to brush up on your computing skills with a textbook - variety is the essence of this book catalogue and in this virtual library you are sure to find the perfect read. 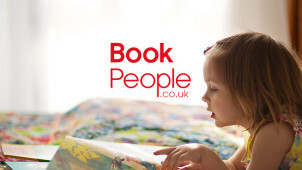 Perfect for children, let their imaginations run wild with Enid Blyton, The Gruffalo and many more beautiful classic and contemporary collections - with dictionaries, homework help and more available to help brighten their scholastic abilities too - Book People has all literary journeys covered. Browse ‘The Blurb’ to stay in the know about all the goings on at Book People and in the literary world too. This blog is brimming with posts galore to introduce you to new titles that are hitting the shelves as well as trending topics and news surrounding books galore. Informative and light-hearted - The Blurb is a brilliant read in its own right and bound to inspire your next adventure with Book People! How do I use my Book People discount code? Offers where no code is provided will be included. Get all the information on what’s on offer from Book People in fiction, nonfiction and much more by subscribing to the mailing list. How much are my Book People Book Points worth? Starting with 200 points to get you a free book of up to £2.50, take a look online to see what higher points values will equate in book terms. How can I order a Book People catalogue? Request your catalogue online and you can then order over the phone, through the post or online using the product code. Does Book People have a sale? You can find discounted goods in the Offers' section of the website. Book People has now introduced a 48-hour delivery service for only £4.95. The Standard Delivery service is FREE on orders above £25, and otherwise, costs £2.95. 30-days returns with Book People for an immediate refund, call 0345 602 3030 in the event that you should want to return your goods. Call Book People on 0345 602 3030 from Monday - Saturday, 9 - 6pm. Use the online form or live chat to get in touch. Picture being sat in the park this summer, book in hand while the sun is shining, you can bring it to life with Book People. This bookseller is on a mission to spread the joy of reading to all by making a grand array of books available for less of a cost. With a Book People discount code, you can be even more certain that you’ll find your favourite reads at incredibly low prices. With collections for children and adults alike, now you can explore titles old and new within an eclectic range of categories that caters to every imagination and curiosity. With new titles in from Victoria Aveyard, Maya Plass and many more highly acclaimed authors in for summer at Book People, a new children's book is the perfect way to keep kids entertained! Why not pick up a Book People voucher code to save on fantastic reads this summer? Explore different categories and classic authors like Roald Dahl and Enid Blyton alongside contemporary series too - there’s no better way to let young minds embark on a journey than with a good book.